The focus may be on 2019 for some, but there are teams still pushing to develop their cars entering the final third of the season, particularly in the title fight. 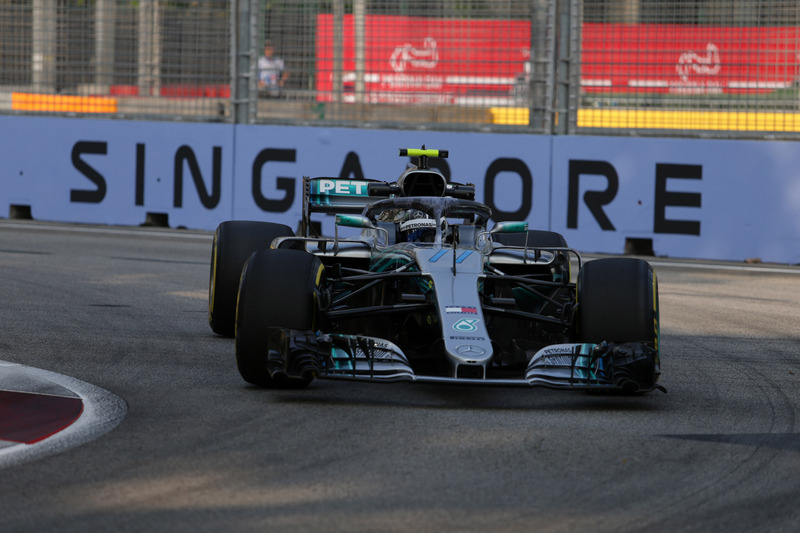 Formula 1 returned to Asia this weekend for the start of the final flyaways, and as the battle for the title intensifies, the challenge of maintaining good pace in the development race becomes ever-greater as the pressure increases. This applies not only to the two championship protagonists, Ferrari and Mercedes, but also to the midfield and lower-end teams where the points gaps are even tighter. 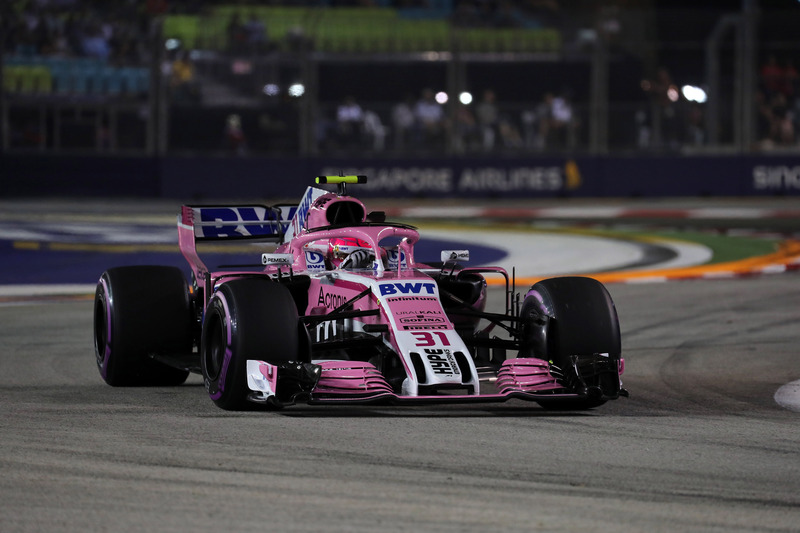 Seeing as the Singapore Grand Prix requires maximum downforce and good cooling efficiency, it is arguably no surprise that most teams have been busy preparing substantial upgrades for this event. Here are the pick of the bunch. The SF71H is probably the fastest car on the grid and, by Sebastian Vettel’s on admission, the title is the Scuderia’s to lose. With the final stages of the season about to play out, Ferrari’s relentless development push has continued in Singapore: further revisions to the car’s longitudinal floor slots were present on Friday, however it was their rear wing endplates that drew the most attention in the paddock. Following in their title rival’s footsteps, Ferrari have incorporated an out-swept design to the endplate that further amplifies the outwash of the air at the back of the car, producing more downforce by mimicking the path of the air as it travels through the diffuser below. Although this design possibly induces a bit more drag than the cleaner endplates it used to run, through its gains in power unit performance Ferrari have more room to make trade-offs in this area. Technical changes aside, the intrigue around Ferrari’s pre-race preparations continues to grow following suspicious activity surrounding the onboard camera. In recent races the mechanics have covered it with a dry ice bag while the car is on the grid, its purpose being to block the camera from viewing the cockpit rather than have any cooling benefit. This began following reports of rival teams getting hold of onboard footage of the Ferrari ahead of the race start, allowing them an insight into what the drivers were changing on the steering wheel: there are also a couple of hidden buttons underneath the silicone hand grips of the wheel that have raised a few eyebrows, and no doubt Ferrari want to keep secret what their function is. 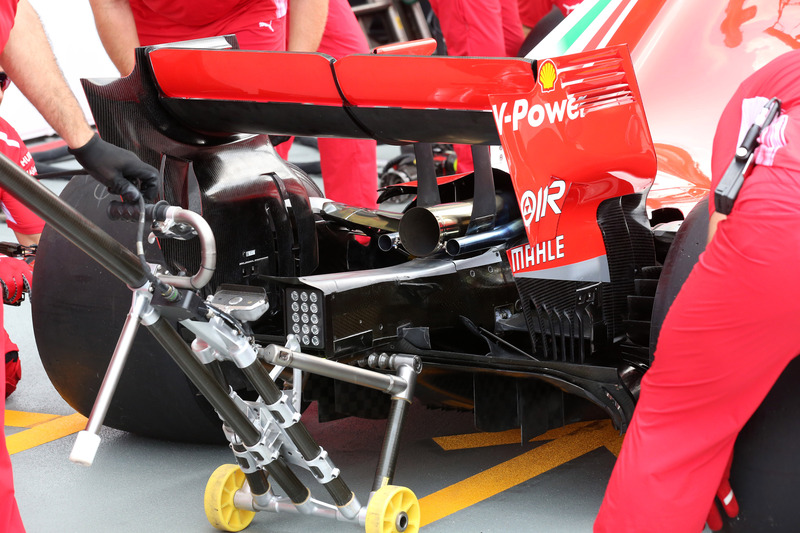 With the FIA stepping in and blocking the team from using a cooling bag – and, in Monza, an umbrella over the cockpit – Ferrari have fabricated an airbox fan cooler that sweeps upwards at an angle to intercept the camera’s view. Although we all know the true intentions behind this design, Ferrari will argue that it is necessary to cool the car when it is stationary and is thus a totally justifiable solution. On the other side of the title fight, the Mercedes updates have been quite sparse throughout the season as the team have concentrated primarily on car setup to eke out extra performance and better tyre management from their W09. Like Ferrari, however, their strike rate for any developments they do bring has been quite successful, even when more widespread changes have been introduced. Singapore has been a bit of a bogey race for the World Champions, and while they have won the night race three times in the past four occasions, the stats don’t provide a full picture of their struggles with the circuit. This is perhaps why Mercedes have targeted this weekend as the time to bring further revisions to the car’s aerodynamics, having seen little changes since Austria. Having run a basic fairing around the Halo since winter testing, Mercedes have finally been drawn into installing a series of down-turned vanes along its periphery to aid the airflow around the roll hoop and bodywork behind. Manipulating the air here in this manner will induce a bit more drag than their previous design, however it may also provide a mechanical advantage too through better feeding of the air through the airbox into the engine – this could prove beneficial in the upcoming warmer Asian climates. At the back of the car the fanned out rear wing endplates – a copy of McLaren’s clever design – have been further refined by extending the slot in the trailing out-turned fin element, just to add a bit more outwash at the back of the car. 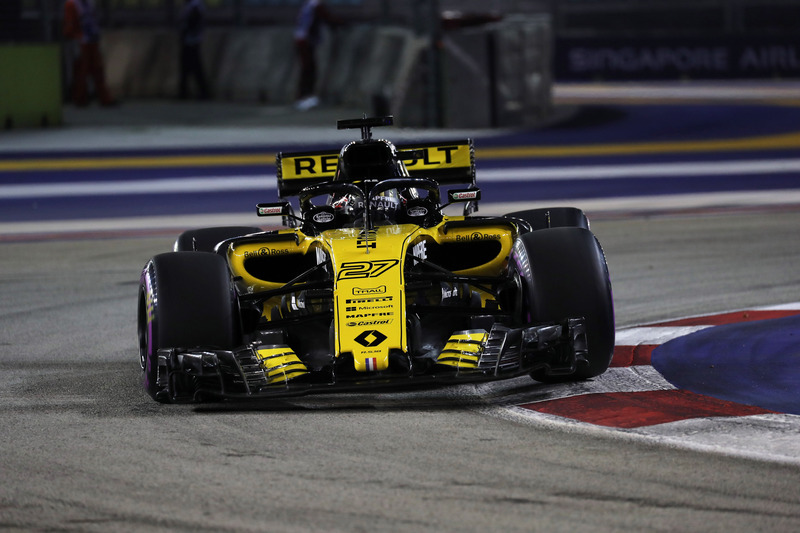 Although the factory team chose not to race it in Italy, Renault’s latest specification power unit was deemed to be a successful upgrade, delivering a step increase in power output and so-far stable reliability through Red Bull. On the chassis side, however, Renault are still lacking in aero performance compared to the top three teams. While 2018 has proven to be a good step forward, the Enstone outfit will need to be more innovative with its chassis design if it is to challenge for the title in the near-future. It is therefore not surprising to see Renault moving away from their tried and tested methods and instead borrow more competitive ideas. For Singapore the team’s popular “aero-cat” sidepod baffles – which have been a feature on their car since 2017 – were removed and replaced by a direct copy of Red Bull’s intricate triple-element design. The baffles protrude into the turbulent wake of the front tyre, shielding the sidepod from chaotic flow while steering angle is applied to improve the airflow towards the diffuser. Following its lift from administration, the Racing Point Force India team have had a cash injection which has allowed it to bring a substantial upgrade to its VJM11 that should have been on the car at the beginning of summer: the bargeboards and the sensitive leading edge of the floor have both moved in line with their rivals’ standards, with the latter area of the car featuring a series vertical strakes to control how the airflow ducks under the car to induce a more even low pressure distribution.